Honey Bee Weddings: Hand Cancel? 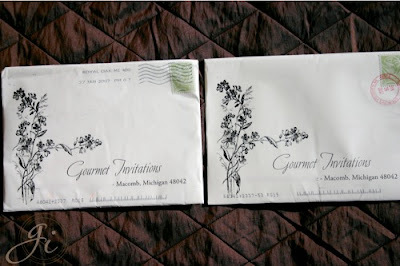 Gourmet Invitations has a great post on their website showing you the difference between hand cancelling your invitations. If you have ever been on the fence, this post should make you realize that it is important to take the extra time to get your invitations hand cancelled. Dear Chicago Brides will realize that this is not an easy task. It is up to the post office worker to decide if they will or will not hand cancel. I have one bride visit three different post offices before getting someone to agree to hand cancel her invitations. Go at an off time (not first thing in the morning or during the lunch hour). Go to a local branch. Smile and be extra kind! If you have had any extra luck with a certain location, please post a comment! I went to the South Branch of the Evanston Post Office and they were great. I dropped off several batched of invitations there. Sometimes they would actually do the hand-canceling for me. Other times they would just hand me the stamp and make me do it myself, but I was fine with that. One thing I learned... if you are using metallic or similarly coated envelopes, the hand-cancel stamp might smear a little. I just brought some clean white pieces of paper and blotted them after I stamped them. I lined them up (on top of each other, kind of staggered so only the stamp part was showing) and blotted about 10 at a time. It didn't take long at all. The photographs do not clearly prove how important hand stamping is. This is in response to Elizabeth's fun fact that photo stamps dont cancel. How did you find this info out and are you sure? I ask because I went to the post office and they told me that they cant hand cancel. I took them back and did some research online about hand cancelling. It does seem like such a shame to have any mark go over a custom stamp. Are you saying that if I bring my invites to the post office, they will get to my guests without any marks at all? I don't know about the custom stamps. We did photo stamps on our response cards. Since guests just dropped it in the mail, we never looked into it. I can tell you- some post offices won't hand cancel. You have to research and find one that will. It's worth it! !